I found myself in London by being a good parent and accompanying my teenage son who was attending a Japanese Anime convention in the city. As this was a all-day event it meant that I found myself at a loose end on a Saturday night in Central London, what to do ?? There were a couple of gigs on locally but I decided to go the whole tourist hog and hit a musical in the West End. 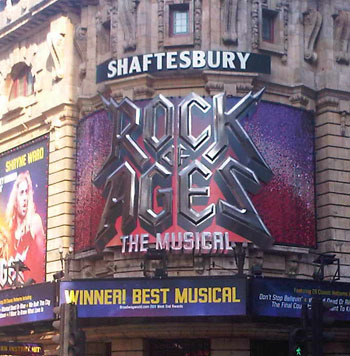 Up until September last year the musical of choice for the discerning rock fan was 'We Will Rock You' but there is now competition in the shape of 'Rock Of Ages'. Having been a smash hit on Broadway for several years it has now made it's way across the pond and has been picking up some good reviews in the past few months. The music on offer will be more than familiar to anyone who was around in the 80's: Journey, REO Speedwagon, Twisted Sister, Bon Jovi, the list goes on. In all there are 28 songs used over the course of the two and a half hour show. Some purists have complained that the songs have been butchered to fit the storyline which is true in parts, but when a show is this much fun who really cares, certainly not the bands as most have championed the musical at every opportunity over the last few years ( keeps the royalties flowing!). The storyline revolves around a couple of key elements, a love story between a budding rock star, from Detroit naturally, and a young fresh faced 'small town' girl in Los Angeles aiming to become a movie starlet who both end up working in Dupree's Bourbon Bar on the Sunset Strip and the threatened closure and destruction of said establishment. Opening the proceedings you get a spoken intro from none other than David Coverdale, which is quite apt as what follows is similar to watching a 2 hour Whitesnake/ Poison/ Twisted Sister etc video from the mid eighties, great rock soundtrack, rock stars aplenty, scantily clad women, lasers and pyro, you get it all and it is all great fun. You are encouraged to join in throughout and they even hand out small lighter shaped torches to be held aloft during the ballads which is a nice touch. As the story progresses, so the musical numbers come and go, 'We're Not Gonna Take It', 'Sister Christian', 'We Built This City', 'Harden My Heart' all 80's classics and you will find yourself singing along, caught up in the moment, hair metal never sounded so good. As with all these stories the course of true love never runs smoothly, will they, won't they and there is the cliff hanger over whether the bar will survive. I won't give away the ending but as the last number is a mass singalong version of 'Don't Stop Believin' I'm sure you can work it out for yourself.